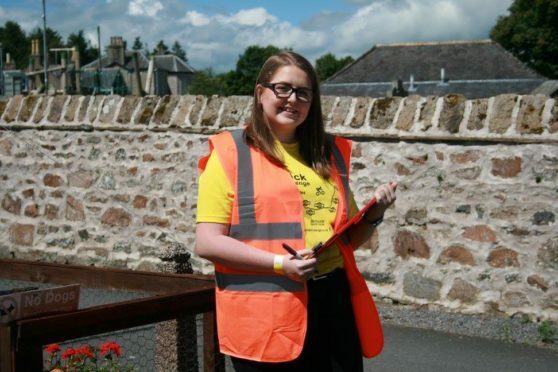 One of last years' Methlick Cycle Challenge marshals wearing the official high-vis jacket. The organisers of a charity cycling event have been forced to change the route after “little tykes” pranked riders sending them on detours during last year’s race. The youngsters donned high-vis jackets and masqueraded as event marshals on the Sheddocksley stretch of the route, directing riders away from the correct path leading to Howes Road. Competitors were pointed down a road towards the city centre instead. “Thankfully,” said event organiser Boyd Ross. “The riders realised they had gone wrong somewhere and managed to find their way back to the proper route meeting it again at Dyce Railway Station, where the Formartine and Buchan Way begins. “The little tykes at Sheddocksley were sending our riders off course. They had gone to the lengths of dressing up in high vis jackets posing as our marshals. “They were sending them round the wrong way – with some adding on miles extra. Now in its fourth year, the Methlick Cycle Challenge raises money for the British Legion and normally begins in Ballater following routes along the Deeside and Formartine and Buchan Way, finishing in the village. However, organisers have now decided to both start and finish the routes in Methlick. Mr Ross hopes to also raise enough funds to give to other local causes, and is trying to attract riders of all ages and levels to take part. Taking the prank in good humour, he said he would not be allowing for any “slip-ups” this year and added: “This year we have decided to remain in the Methlick area, and we will be going over the routes thoroughly with all those taking part. Entries are now open for the Methlick Cycle Challenge for either the 67 miles, 40 miles or 20 miles routes taking place on Sunday, July 15 starting between 10am and 1pm.